Controlling your pet’s shedding is essential to preventing their thick coat from getting matted up, while also providing airflow to their skin underneath to prevent itching and the irritating (to humans) dander from building up. A deshedding brush is perfect for helping you get rid of loose hair, keeping it from landing all over your house. With the DakPets deshedding brush, you don’t have to worry about the hair ending up where you don’t want it, but there are also a few more hidden benefits to using it on your dog. Professional Grade Construction: There’s a reason that professional groomers around the world have relied on DakPets products in their own business for so long: they’re built to last. You won’t have to worry about the handle snapping on you, or the bristles bending with their deshedding brush. Gentle On Your Pet’s Skin: Some deshedding brushes get sharp on the ends, which can cause your dog to become irritated, and run every time you get the brush out. The durable stainless steel bristles on the DakPets brush, though, will not sharpen, and actually give your dog a micro-massage that they will look forward to. Breaks Up Tough Mats: German Shepherds are known for getting mats in their fur, especially if you don’t brush them often enough. The DakPets brush will help break up most mats, and can be combined with a conditioner to work through even the most stubborn balls of fur. Reduces Pet Dander Buildup: Pet dander is the leading cause of allergies in humans. If someone in your home is sneezing and gets watery, red, irritated eyes when your dog is around, you might have to spend some time with the DakPets brush to get rid of the dander that’s built up in your dog’s fur. Perfect Size For Large Dogs: The wide design of the DakPets brush makes it easy to cover your large dog. Each stroke of the brush covers more hair than smaller designs do, which saves you time, making it a lot easier to do on a regular basis. Requires Regular Brushing If The Hair Is Badly Tangled: The thin metal bristles on the brush are going to have a hard time getting down into your dog’s undercoat unless you’ve already put in the time to brush them out with a normal brush, like the FURminator. 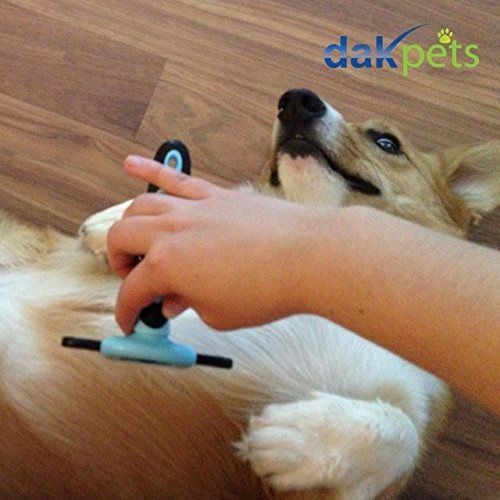 From getting rid of pet dander, massaging your dog’s skin, to breaking up tough mats, the DakPets deshedding brush is a winner in our book. Your dog will love getting brushed, and you’ll love not having to deal with loose hair all over the place, getting on your furniture and your clothes. To learn more about the hidden benefits of the DaksPet deshedding brush, and see why so many other customers love it, click on the button below.